In the world of trance, there are not many names that garner as much attention as Above & Beyond. With the success of ABGT that premieres Friday of each week, to each massive hit released from their Anjuna label, Above & Beyond truly know how to reach out and impact their fans. Every song tells a soulful story, taking the listener on a journey of both the heart and mind. It is then to our wonderful surprise that the trio released today the album to stream through iTunes Radio, giving fans their first glimpse into all that is We Are All We Need. My review of the album is below, but do not take my word for it, listen for yourself. The album begins with a track devoid of vocals. While not every A&B track has them, it is something we are accustomed to hearing. However, the lack of vocals is actually a strength of “Quieter is Louder”. It builds a foundation for the album, one of hope and thoughtfulness. Each song is intentionally emotional, with “Quieter is Louder” being no exception. Listening to it I cannot help but feel a sense of wonder, an impending journey of which I cannot pretend to be prepared for. This song will be played in part during sets throughout the tour, hopefully to a crowd that is waiting for their journey to begin. The title track from the album comes next, “We’re All We Need.” Anjuna has always perpetuated the belief that every fan is part of a larger family, the Anjuna family. Whether your interest in A&B is fleeting, or it is a passion you cannot keep to yourself, you are still a part of that family, for life. When this track plays, the eerie vocals from Zoe Johnston inspire a togetherness that reverberates from ear to ear and heart to heart. Each track is played in such an order that a story is born. The names of each track give you enough information to interpret the story, but only in a general sense. There is a powerful message lying intertwined with the dreamy melodies and entrancing lyrics. The trance genre is an umbrella term for an incredible array of styles and themes. Ranging from uplifting and positive, to emotional and heart-breaking, all the way to a deep sadness that can pervade the very essence of a song. 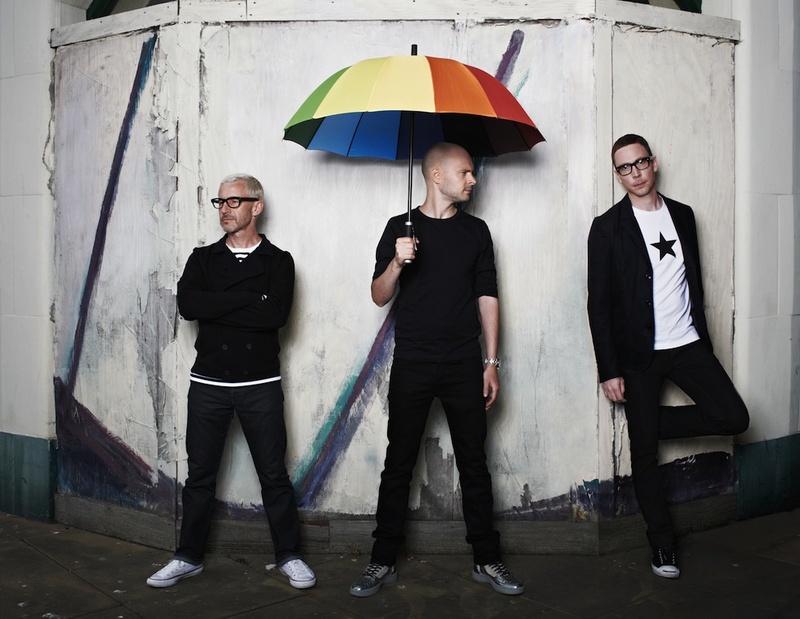 Above & Beyond utilize an umbrella in some of their shows, it is also shown in the picture for this article. There is no true style for this trio. Nothing is off-limits or too big to tackle. What does inspire their music, and more specifically this album, is the importance of the people in your life. “Sticky Fingers”, “We Are All We Need”, “Counting Down The Days”, “Save me”… Each song title bears a striking resemblance to people and the impact they make. There are no happy accidents where Above & Beyond are concerned. If you have ever been to a performance of theirs, the way in which they interact with the crowd seems almost distant at times. In other moments, their selective style of typing onto the screen behind them is incredibly powerful. A live performance from Above & Beyond is a work of wonder. The music is just as important as the people you are surrounded by. Anyone who has been involved can tell you that you feel a bond with the thousands of people standing around you. Time loses importance and you are transported into their world. This album accomplishes close to the same feeling. The flow of each song, one to the next, is mesmerizing. There are no choppy transitions or out of place tracks. Everything is exactly where it needs to be for the listener to have the entire experience. We Are All We Need is a masterpiece of arrangement as much as it is art. Music is so often compared to feelings we cannot find words for and this album only reinforces that notion. Each track is a unique performance that can stand alone and shine, together however, this album is a force to be reckoned with. It is a roller coaster of emotion in the best possible way. The style changes from song to song, no two sound anything alike, nor are any of the vocals similar. This imbalance forces the listener to confront each song on its own, though as part of the larger whole. You look to your left and right as you listen, thinking of the people you need in your life; those that you just cannot get out of your head; those that you want to get up and dance with; those you make plans for, no matter what you’re schedule, and even those you treasure. Above & Beyond have created not just an incredible album from a musical standpoint, but also one that makes you think and wonder, long after the last song fades and your music is put away. You may not need to reevaluate your life, but you will definitely look at those closest to you with a newfound perspective. Whether you listen to this album in pieces, or all the way through, you will find something that catches your breath and makes you replay the song just one more time. We are still one week away from the official release of the album and having heard it all already, I can tell you everyone will be playing Above & Beyond on the 20th. Don’t forget to preorder the album on iTunes and tune into iTunes radio to stream the full album live. Come with a smile on your face and happiness in your heart, Above & Beyond deliver a phenomenal performance that will not fade into obscurity.